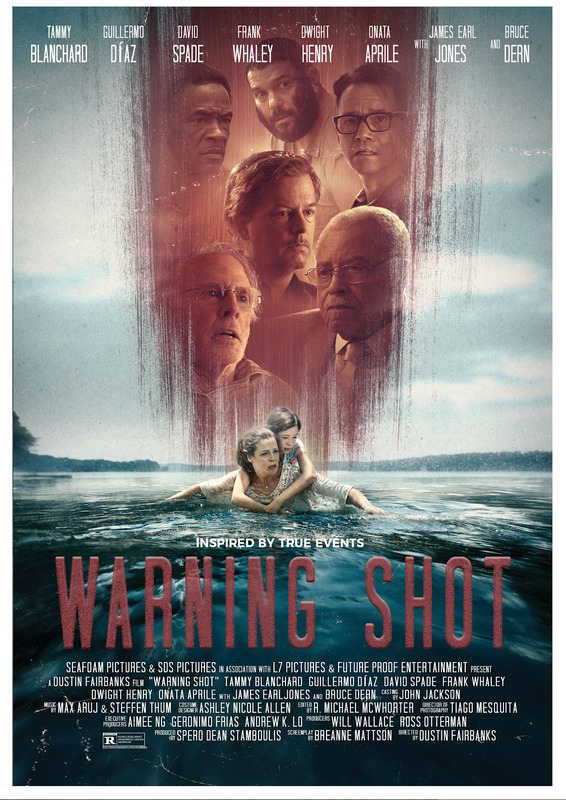 Here is the trailer from the upcoming film “WARNING SHOT” The film is directed by Dustin Fairbanks, starring David Spade, Guillermo Díaz, James Earl Jones, Bruce Dern, Tammy Blanchard, Dwight Henry, Onata Aprile, Niki Koss, Steve Eastin, Robert Johnson, Dustie Hale. WARNING SHOT IS IN LIMITED RELEASE NATIONALLY IN THEATERS- opening September 14, 2018 select theaters nationwide and VOD (NYC, Flushing-NY, Universal City-CA, Anaheim-CA, Corona-CA, Rancho Palos Verdes-CA, Costa Mesa-CA, Whittier-CA, Altamonte Springs-FL, Atlanta-GA, Maplewood-NJ, Cleveland-OH, Pillipsburg-PA, Hudson Oaks-TX, Palestine-TX, Weatherford-TX, Bay City-TX, Corsicana-TX, and Bastrop-TX). Audrey (Tammy Blanchard), a single mother to daughter, Cheyenne (Onata Aprile) is trapped in a constant struggle to make ends meet. When her grandfather passes away, she inherits the family’s farm-house, for which the lucrative water rights are coveted by Calvin (Bruce Dern) a longtime business rival of Audrey’s grandfather. Calvin’s own grandson, Bobby (David Spade), is on a mission to prove that he can take on the family business, and decides to take matters into his own hands by hiring the mentally unstable Rainy (Guillermo Díaz) and drug-addicted Jawari (Dwight Henry) to intimidate Audrey and Cheyenne into giving up the property. Once Bobby’s goons realize Audrey does not intend to go quietly, the situation quickly spirals out of control. In this 87 minutes high stake thriller, marking David Spade’s first dramatic role, we witness the strength of a mother doing everything within her power to protect her young daughter.